Current world champion and double world champion Sebastian Vettel successfully gained 4 places from his qualifying posistion. This started by jumping team mate Mark Webber & rookie Romain Grosjean at the start of the race, then chasing Michael Schumacher down and getting a free pass when the veterans car seemed to suffer a hydraulic failure. 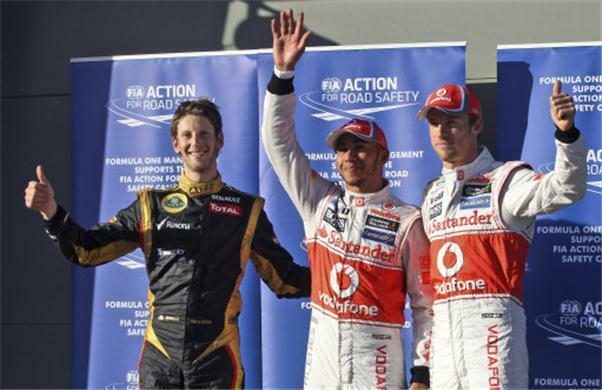 Vettel then optimized the safety car one lap after both McLaren's pitted splitting Jenson & Lewis until the end. Lewis Hamilton dominated qualifying yesterday but quickly found himself down to 2nd after team mate Button jumped him at the start. Lewis was able to keep the gap to around 3seconds to Button & seemingly had Vettel under control. 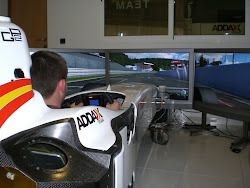 This was until he pitted straight after his team mate and the lap after the safety car was deployed. This meant Sebastian Vettel could get into the pits and get ahead of him due to Lewis being restricted to slower sector times by the FIA for safety reasons. Hamilton finished 3rd and seemed demoralized on the podium not spraying his champagne and just lifting his 3rd place trophy with 1 arm. Australian hero Mark Webber started 5th of the grid but quickly found himself down the grid and battling with fast starting Fernando Alonso & fellow slow starter Nico Rosberg. The Australian was locked stuck behind Nico Rosberg but after the 1st set of stops Webber was able to get in front of the German. He quickly closed the gap between himself and Alonso who was able to pull away during Webber & Rosberg's dual. Mark - like his team mate - was able to use the safety car and a pit stop just after it was deployed to jump a head of the Ferrari driver. At the restart Webber was able to stay on the back of Hamilton but couldn't get past. 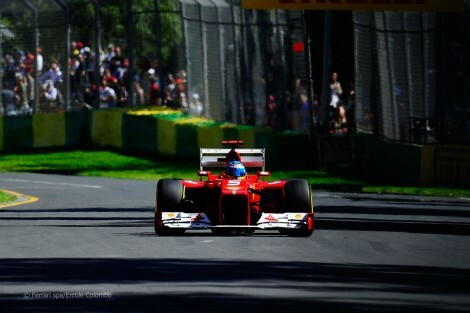 Fernando Alonso had one of the performances of the race. Dragging his apparent terrible Ferrari from 12th to a very respectable 5th posistion. Alonso jumped ahead of Rosberg & Webber at the start and was in a battle with them until around the 2nd pit stop period. The 2005 & 2006 world champion was unluckily jumped by Webber due to the timing of the safety car but he was able to loose Rosberg. Nervously though Pastor Maldonado attached himself to the rear of Alonso but on the last lap dropped the car into the concrete wall at turn 6 leaving the Spaniard to cross the line. The crowed favourite Kamui Kobayashi had an very strong race for Sauber and underlined they do have true pace. 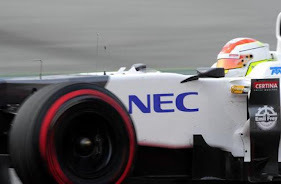 Sauber were unlucky yesterday & even McLaren team principle Martin Whitmarsh thought they could have easily got into Q3. 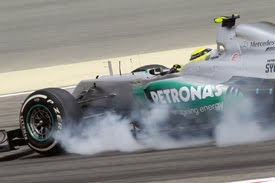 Kamui was able to jump into 6th posistion after Nico Rosberg approaching the 2nd to last final corner rear ended Sergio Perez. This left the Japanese to fly past both them and grab some critical championship points. Returning 2007 world champion Kimi Raikkonen struggled in qualifying only finishing a poor 18th but the Fin had a cracking race working his way up the grid. Kimi showed at times some mighty pace in the Lotus Renault car & also that he is not rusty pulling some good overtakes & battling well. This time last year Sergio Perez made an outstanding debut whilst only doing a 1 stop on these high degrading Pirelli tyres and hes done it again. Perez performed the same strategy as last year only completing 1 pit stop and working his way from dead last (22nd) and to finish 8th collecting even more points for the Sauber team. Daniel Ricciardo started this season with very little Formula 1 knowledge, he had entered a small handful of Grand Prix last year with struggling HRT but comes into this season as pretty much a rookie driver. The young driver scored a solid 9th place after taking advantage of the Rosberg/Perez incident at the end of the last lap & to but the cherry on top, it is his home Grand Prix. The young Australian put in a solid shift and Toro Rosso might be counting themselves lucky after not looking like they would score points in this race. Force India seemed to start this weekend strongly and were quoted as saying they wanted to score points in every race this season. 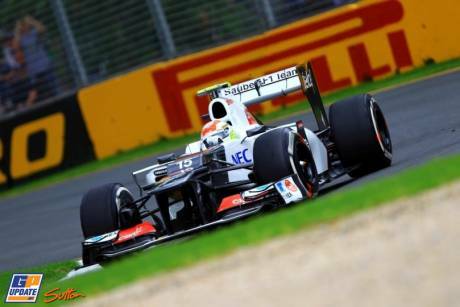 Paul di Resta has got them off to this goal by clinching a scrappy 10th posistion after the incident on the last lap. The Force India showed good pace over the whole weekend and can look forward to Malaysia. Going into the second round of the season you has come clear that both McLaren & Red Bull are clear front runners with a very close midfield behind them that has the possibility to throw up drama. Below I will state some of my thoughts of the Australian Grand Prix. 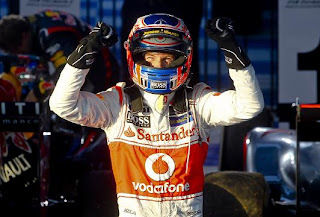 McLaren performed immensely easily controlling the gap between themselves, Red Bull & the rest of the field. Despite Lewis loosing out to Sebastian Vettel, McLaren fans can feel confident heading into the 2nd round of the season. Despite Jenson Button winning in brilliant fashion I feel Sergio Perez had an outstanding race, performing only 1 stop but also still being fast and race involved. 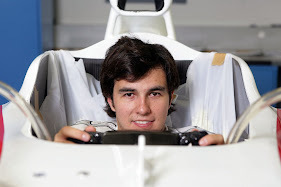 The Mexican seems to have fully recovered from his accident in Monaco & he is my driver to watch this season. Mercedes looked second fastest in Friday & Saturday of this weekend but with Michael Schumacher retiring due to a reported hydraulic problem & Nico Rosberg just not seeming to have the pace shown earlier on in the weekend. 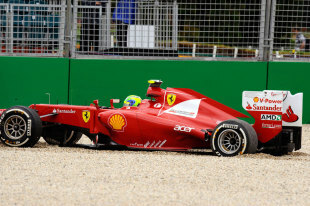 Felipe Massa has struggled in the F2012 all weekend spinning off in Friday practice 1 & finishing 16th in qualifying. Massa also had another accident with a fellow driver when he tried slipping one down the inside of Bruno Senna at turn 4, but the Ferrari & Williams driver ended up locking together and both retiring due to damage sustained. A little more comical on this section. My favourite moment of this race has to be when returning star Kimi Raikkonen radioed into the team asking why blue flags and being waved at him and what do they mean? The team simply replied "Kimi they are not for you!" 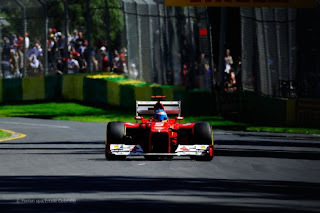 What did you make of the Australian Grand Prix? Let me know via a comment or Tweet me by the link below.